Spaghetti squash is one of my favorite winter squash varieties that we grow here at Tumbleweed Farm. Unlike most winter squash varieties (which are similar in flavor and texture and interchangeable in most recipes) spaghetti squash is a little different. It’s not quite as sweet as its orange fleshed siblings, and it has this “magical” little trick that after you roast it, you can use a fork and scrape out ribbons of squash that resemble spaghetti noodles. 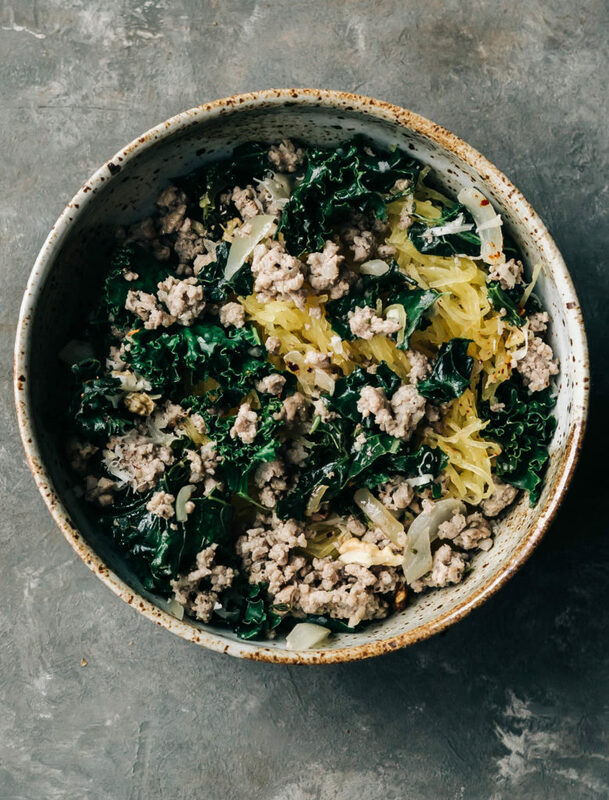 Spaghetti squash is a great vehicle for any of your favorite pasta toppings however, because it does have such a lovely flavor on its own, I didn’t want to smother it in a creamy tomato sauce. Instead, I kept the topping light and let the squash shine. This recipe seems way too basic to be as delicious as it is, but trust me on this one–this might be our favorite recipe this fall. I hope you all enjoy this meal as much as we did. Grab a fork and dig in! Preheat the oven to 400F. Use a sharp knife and steady hand to slice 1/2 inch of both ends of the spaghetti squash. Then stand the squash up on one of the ends to stabilize it and slice it in half lengthwise. Scoop out the seeds and place the squash cut side down on an oiled baking sheet. Bake until the squash is tender and can easily be pierced with a fork. About 35-45 minutes. Remove from the oven and let the squash cool a bit. While the squash cooks prepare the topping. Heat a large, deep skillet over medium heat. Add the pork sausage and cook, stirring occasionally, until browned on all sides. With a slotted spoon remove the pork from the pan (reserving the grease). Add the onion to the pan (if the pan is dry add a touch of bacon fat or oil) and cook, stirring occasionally until tender, about 5 minutes. Stir in the garlic and cook for one minute longer. Add the kale and cook, tossing until the leaves being to wilt a bit and turn bright green. Add the sausage back to the pan along with a pinch of crushed red pepper flakes and a pinch of dried thyme. Use a fork to scrape out the strands of "noodles" from the spaghetti squash and add them to the pan along with the grated cheese. Toss well and cook until just warmed through. Season to taste with salt and pepper and divide between bowls and enjoy. This does sound like a really nice way to eat spaghetti squash. My experience with that squash makes me want to warn people not to overcook the squash – besides losing its spaghetti-ness, it also becomes quite bitter when overcooked. If anyone uses a smaller squash, they should reduce the roasting time accordingly.